Hello Friends! I took a little break from my Goodie Bag die, but I still made a bag of sorts. This time I used the Petite Purse die from Stampin' Up! 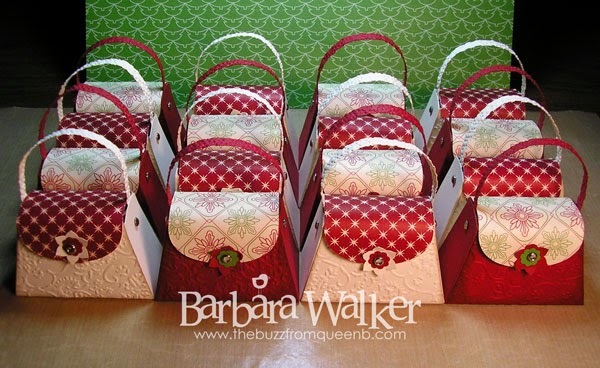 These sweet little purses will be used to hold a small gift and to serve as table favors at a Christmas Tea next month. I think the ladies will like them! I created these assembly line style, so I could crank them out quickly. For some reason, the vanilla purses gave me FITS. The red card stock was fine, but not that vanilla! Yikes! This project involved lots of die cutting, lots of punching, lots of gluing and lots of patience! After die cutting the bags, I die cut more card stock to use as front panels and I also die cut the patterned papers. I embossed the front panels to add a bit of texture and I inked around the edges. I also embossed the handles of each purse. 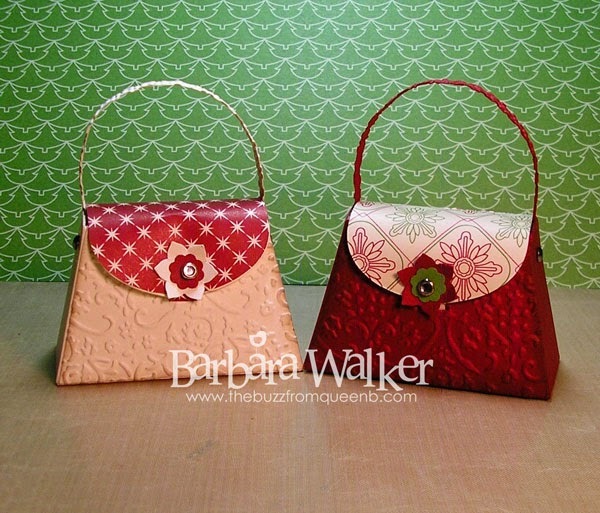 After I assembled the bags, I added the floral embellishment to finish them off. Oh Barb, it's been terrific seeing how crafty you've been recently and oooohing and ahhhhing over your fabulous work. These fantastic purses are no exception. You have such attention to detail. Sorry the one cardstock gave you fits, but you sure couldn't tell looking at the beauties you created! These are beautiful. I have a question for you -- did you find that the die cut a little too deeply into the card stock? I made some of these into first aid bags for all of my daughter's graduation class. They came out adorable, but had to use scotch tape to keep them together. Needless to say, I wasn't totally happy with the project but her classmates loved them.